Ever since I can remember, I’ve known that there’s no such thing as too many chocolate eggs for Easter. When I was a child, chocolate was a rare treat, so I looked forward to Easter with eager anticipation. I’d make my chocolate Easter eggs last over the entire Easter holidays and beyond. That seasonal excitement has never left me and I’m sure that’s part of the reason I like to celebrate Easter. Of course, Easter isn’t just about the chocolate. It’s the harbinger of spring, which is why we celebrate with eggs and bunnies; it’s all about new life burgeoning forth. With the primroses now out in Cornwall, I can definitely feel the sap rising and a spring in my step. Now where are those chocolate Easter eggs? Hotel Chocolat never fails to please and has long been a favourite of mine. Their thick shelled chocolate Easter eggs are legendary and remind me of how Easter eggs used to be when I was a child. The quality of their chocolate is really good and they’re continually innovating when it comes to flavours. Some of you may be tired of me droning on about dark milk chocolate being my absolute favourite. Hotel Chocolat’s chocolate has a minimum of 40% cocoa solids, which is substantially higher than most high street chocolate. This 390g Just Milk egg is perfect for me. The egg comes in two halves: one is made of their house 40% and the other is my favourite 50%. I’m saving myself for Easter, but I’m really looking forward to this. And yes, I’m keeping this one for me. Divine have a fantastic range of chocolate Easter eggs this year and I find their bright turquoise and gold packaging looks absolutely fabulous. There’s something to suit everyone, both in terms of taste and price. Head over to their online shop to see what other Easter eggs they have to offer. Divine is a good option if you’d like to spread the chocolate love and ensure your Easter egg purchases are truly Fairtrade. The cacao beans for Divine’s chocolate are grown in Ghana by over 80,000 smallholder farmers who make up Kuapa Kokoo, a co-operative that owns 44% of the Divine company. This means they share in the profits and can then invest in their communities. All ingredients are Fairtrade and vegetarian. There are no articifical colours, flavours or preservatives to be found and only 100% cocoa butter is used. The eggs are widely available from most supermarkets, Oxfam and other high street stores. I’ve managed to hold myself back form demolishing this milk chocolate egg – so far! It’s made with the same chocolate as the classic Divine milk chocolate bars, but has the added bonus of containing a clutch of mini praline eggs. The eggs are wrapped with coordinating turquoise and gold foil and the whole thing comes in at 260g. £9.95. It’s been a long time since I had the joy of sampling some of Bettys delightful chocolate. Some of you may remember the Tour de France bear or the oh so adorable chocolate otter. Their chocolate Easter eggs do not disappoint. They are well crafted, elegant and beautiful to look at and the finest Swiss chocolate just melts in the mouth. Unless you’re lucky enough to live near one of their Yorkshire shops, you’ll need to purchase these online. In 2009 Sipsmith became the first copper-pot based distillery to start up in London for nearly 200 years. The gin is hand crafted in small batches and is said to be a particularly dry one with bursts of juniper and zesty citrus notes. Although I’ve never tried it, I’ve been told on good authority that their gin is one of the best. This augurs well for the gin truffles shown below. If I had to pick just one of these chocolate Easter eggs, I’d find myself in a near impossible situation. Betty’s eggs delight the eye, Divine is ethical with interesting additions to their eggs. Hotel Chocolat is reliably delicious and well, who can resist gin truffles? Now which one would you choose? Why not pin these chocolate Easter eggs as a reminder? Disclosure: I was sent these products for the purposes of this chocolate Easter Egg guide. I was not asked to write a positive review and as always, all opinions are my own. All but the Sipsmith’s picture are my own. Supporting the brands I work with helps keep Tin and Thyme blithe and blogging. Those spring flower eggs are the prettiest! I think they might be my favourite to look at Angie. 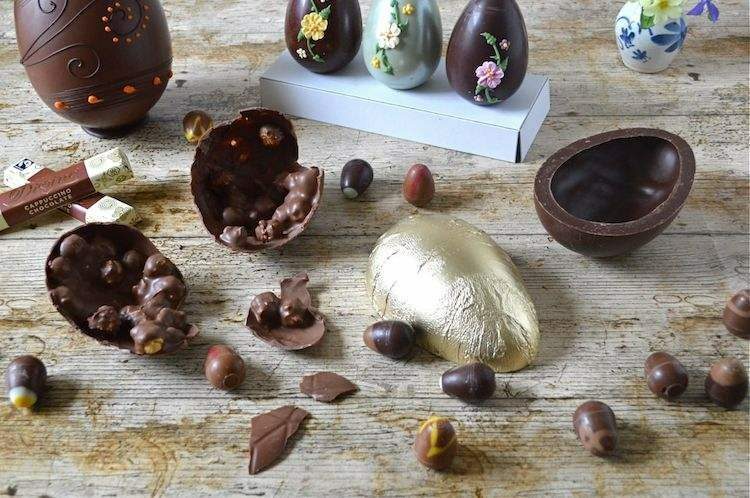 I personally love the Hotel Chocolat Easter eggs, but I’ve recently got a taste for Divine chocolate so I am torn about what to ask for this year. It’s a tough choice for sure. How about asking for two? Ooh a lovely selection of easter eggs. I love the look of the one with the popcorn inside! The Divine popcorn egg is just brilliant. Lovely selection. I adore Hotel Chocolat, such good quality. The Bettey’s eggs are so pretty and who could resist a gin truffle? Well I’ve managed to resist those truffles so far, but I’m trying really hard! Those trio of eggs really are pretty and I guess that’s partly what spring is about. Being a chocolate lover, all of these sound so good, I want them all please! YOu’re right! The best of the nest! Love it! Oh wow! They are beautiful! Perfect for Easter! Indeed Jehan. I’d be happy to be given any of these for Easter. Such pretty eggs, all of them! The flower ones are so gorgeous! Well hang on in there, you just never know your luck. Well this is very true, but surely everyone deserves a chocolate egg for Easter. They are so many beautiful chocolate treats. So mouth watering! There are so many Easter eggs to choose from, I thought this selection might make it easier to choose. beautiful and delicious Easter eggs! Look wonderful! Happy Easter! How lovely to hear from you Gloria. It’s been a long time. The Easter eggs just seem to get better each year. I wish you a very Happy Easter too.